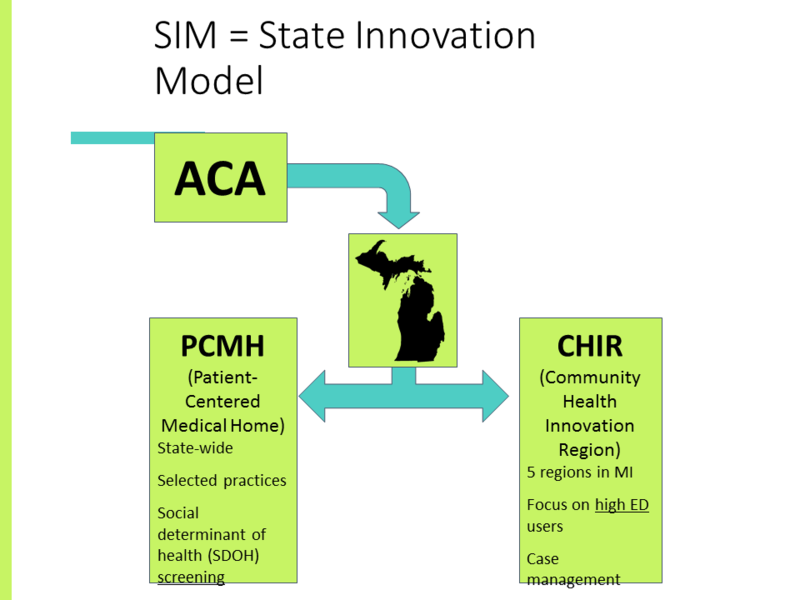 • Three health systems in Livingston and Washtenaw counties are participating in the SIM Patient-Centered Medical Home (PCMH) initiative. The goal of this initiative is that each primary care office will complete a Social Determinants of Health Screening for all primary care patients. • Participating health systems include Michigan Medicine, St. Joseph Mercy/IHA, and Huron Valley Physician’s Association. • Patients who screen positive for a social need can receive a referral to a social services agency who can help the patient to address their need. • Data collected from the screenings will be aggregated at the community level to inform service needs and identify service gaps across Livingston and Washtenaw counties. Are you worried that in the next few months, you may not have safe housing that you own, rent, or share? Do you ever eat less than you feel you should because there is not enough food? Do you have a dependable way to get to work or school and your appointments? Do you have a job or other steady source of income? Do you have enough household supplies? For example, clothing, shoes, blankets, mattresses, diapers, toothpaste, and shampoo. Do you think completing more education or training, like finishing a GED, going to college, or learning a trade, would be helpful for you? Does getting child care make it hard for you to work, go to school or study? In the past month, did poor physical or mental health keep you from doing your usual activities, like work, school or a hobby? In the past year, have you had a hard time paying your utility company bills? In the past year, was there a time when you needed to see a doctor but could not because it cost too much? Would you like to receive assistance with any of these needs?